When we think of the most innovative industries today, airlines aren’t often top-of-mind. But while you may not think of them right off the bat, when it comes to embracing mobile technology, they’re actually ahead of the game. That’s not to say there isn’t room for improvement (there is), but airlines are beginning to seize the opportunities that mobile offers, recognizing that their customers are, by definition, on the move — and that one way to compete in this crowded, price-driven space is to offer a better customer experience. Let’s take a look at where mobile technology for airlines stands today and where it’s headed in the near future. Airlines have gradually incorporated technology into the travel process over the last few decades. They have added monitors and kiosks to simplify the ticketing, baggage drop and check-in processes. But these technologies, disjointed and unreliable as they often are, don’t do a whole lot to improve the flying experience as a whole. Most of today’s travelers arrive armed with their smartphones, and airlines have begun to recognize this dynamic as an opportunity for innovation. Of course, there’s been a little turbulence as airlines get their mobile strategies off the ground. Most airlines offer mobile-optimized websites, but these rarely cut it for interaction-rich experiences like ticketing and check-in. It’s true that mobile websites can help airlines connect with and serve customers who don’t yet have their apps installed, but in most instances the web versions have pared-down features, take longer to load and are often less intuitive than their native app counterparts. Mobile apps can offer better customer experiences by taking full advantage of mobile device capabilities. Most airlines have at least one these days, and the main feature set is fairly standard. Basic information and tasks like check-in, flight status updates, seat change requests, mobile boarding passes and general flight information can and should be available through mobile apps for every traveler. Any airline that wants to remain competitive should offer a mobile app that covers these functions. But you can’t stop there. Beyond the basics, there’s a whole range of other functions airlines can offer to make the experience of flying simpler and more enjoyable. 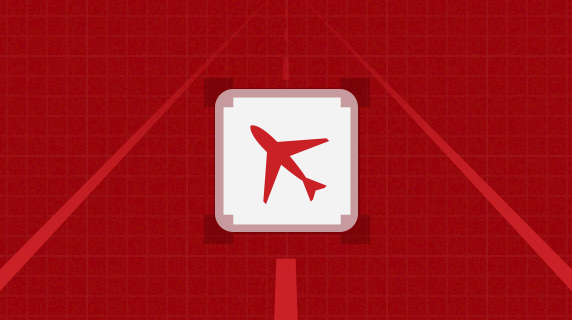 To that end, Delta may be the most forward-thinking airline when it comes to mobile strategy. By designing different apps for different parts of the travel process, they clearly demonstrate that they have embraced the “more apps is better” mindset. Their offerings include an app called Fly Delta that helps with mobile booking and pre-travel details like flight status, check-in and upgrades, as well as an in-flight content hub accessible from any mobile device for entertainment while on board. Perhaps the coolest feature inside of Delta’s mobile offerings is called “Glass Bottomed Jet” which allows passengers to check out a birds-eye view of the landscape they are flying over, with photos, landmarks and Wikipedia pages appearing on the screen. Last fall, Delta also announced that they would be rolling out Windows phones to their team of more than 19,000 flight attendants, enabling their employees to take advantage of having mobile technology in the palm of their hands. United is also embracing a BYOD approach, having recently launched a content portal that passengers can access from the devices they bring on board. Recognizing that there is money to be saved by leveraging these tablets, phones and laptops, new additions to the United fleet don’t include seatback TVs, and instead offer Netflix-style access to movies and TV shows available for streaming. Users just have to have the United App downloaded prior to the flight, and they can sit back, relax, and enjoy classics like “The Godfather” from the friendly skies. Air France has expanded their mobile footprint into the clouds with another unique in-flight experience. Rather than focusing on the more mundane details of traveling, they have developed an app called Air France Music. The app features exclusive content that is meant to enhance your sensory experience while flying. Mobile products like this highlight what is possible beyond the obvious features that users are coming to expect on mobile from airlines. Another piece of the mobile-first puzzle is in-flight internet access. In-flight WiFi has been around for several years, but notoriously high prices and questionable connectivity quality have crippled adoption (only about six percent of fliers actually purchase WiFi in-air). Airlines should be looking for ways to improve the customer experience aboard by by offering amenities like WiFi at reasonable prices and with reliable connectivity. Many business travelers choose their flights based on which planes have the most reliable WiFi. At the end of the day, if airlines aren’t laser-focused on delivering great customer experiences — whether via custom mobile apps or reliable internet connectivity to power those apps — they risk losing customers. Airlines have made good progress to date, but there’s still plenty of work to do to fully capitalize on the mobile opportunity. Wearables, for example, can and will greatly impact the air travel experience. Virgin is already experimenting with ways that Google Glass could improve customer service efforts, by allowing representatives to pull up traveler information, flight schedules and more quickly and seamlessly. Apple Pay and Apple Watch could also herald further innovation in the travel experience as soon as next year. Simplified payments powered by NFC technology are perfect for airports, allowing travelers to more quickly pay for a cup of coffee or grab a magazine on their way to catch a flight. Smartwatches could be used to present boarding passes, verify identification, guide travelers through unfamiliar airports, deliver real-time fight updates and even facilitate the rebooking process when a flight gets canceled. Regardless of which mobile technology takes off next, one thing is certain: mobile has changed how consumers expect to be able to experience the world around them. Airlines that adapt quickly and offer experiences tailored to our preferences will gain satisfied customers and loyal brand advocates. This will enable them to differentiate themselves in today’s experience economy, which — make no mistake — exists both on the ground and 30,000 feet in the air.